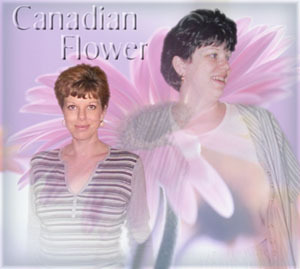 Flower's Journey From Fat to Fabulous! Inspirational Quote: Click to View or Add Text. Most stories start out with "I was heavy even as a child", but I can not say that. I never had a problem with my weight during childhood or in my teenage years. My first experience with gaining weight happened when I was 19. I had quit my job as hostess at McDonalds to go to school. The lack of exercise as well as the habit of still eating McDonald's food cause a slight weight gain. With my wedding right around the corner, I joined weight watchers and lost that weight no problem. I guess I believed that since I lost the weight, I could go back to poor eating habits and not have to worry about my weight anymore. Silly me! Three months into my marriage, I got pregnant. I used that as an excuse to eat whatever I wanted. I was eating for two afterall! I had a difficult pregnancy, complicated labor and health problems after the birth which the doctors told me was due to the weight I gained. (Of course I know now what actually caused the problems with my pregnancy, APS). At this point I was overweight by about 30 lbs but didn't think I looked bad at all. I tried many times losing the excess weight but just was never motivated. 18 months later, I got pregnant again and kept up with the 'eating for two' way of thinking. In 1993, my second son was born and I was still holding at 30-40lbs overweight. Several half-hearted attempts to lose weight followed in the next couple years but I still didn't feel that I looked bad or that I was 'fat'. Then came a major life change. My husband and I moved from Kelowna, were we both had friends and family, to a small town in the Kootenay's to open a pizza restaurant. We eventually opened two restaurants in neighboring towns. I'm sure you are all laughing now, "pizza! that explains the weight gain"... yes that was a big part of it. All the free pizza, pasta and ribs we could eat. Add that onto the stress of owning a business and I ballooned out. By 1998 I was at my all time high of 281 lbs. Even on my 5'9" frame I could not longer fool myself into believing that I did not look 'fat'. I did join weight watchers and tried to lose weight, but our life was really stressful and I just couldn't do it. After the pizza restaurants were sold, one in 1996 and the other in 1998, things were still very stressful with my husband going to school to become a welder. Ok, I'm sure this is the part that you are all waiting to hear... what inspired me to finally do it. Well, one day I turned on the TV and the Oprah Winfrey show was on. I rarely ever watched Oprah, but on that day she had guests who had lost large amounts of weight (Jared from Subway was one of the guests). I sat down and was glued to the TV. I guess something clicked in me watching that show, I thought to myself "These are all just normal, average people and they lost weight, maybe I can do it too". The next day I pulled out all my weight watcher's material (after all I had joined and quit 5 or 6 times). I still was not sure that it was going to work, so I decided to just do it on my own and tell nobody. I followed the weight watcher's 123 plan, which in my opinion is a wonderful plan for anyone who wants to lose weight or eat healthier, and the pounds started melting off. The more I lost, the more motivated I got. I started exercising, a little at first and then up to 45-60 minutes, 6 days a week. It was actually working for me! I was losing weight and more importantly, I was feeling good. Then, when I was about 40 lbs from my goal weight, I started having health problems. I was not able to exercise and it was very stressful not knowing what was wrong. In May of 2001, I was diagnosed with Antiphospholipid Syndrome, which is an autoimmune disease. I am happy to say that even faced with this challenge, I still managed to keep losing weight. It was slower due to the fact that I had to cut my exercise back a lot but I was still losing. 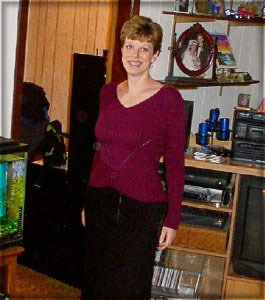 In October of 2001, I reached my goal weight of 149 lbs. That is over 130 lbs lost! I have maintained that loss since them and am finally able to see myself as a thin person rather than a 'formerly fat' person. I can not tell you how good it feels to have suceeded in losing the weight, I feel like a completely different person. In fact, quite a few people have not even recognized me! Some people even thought my husband got himself a new wife *laugh*. It is more than just the looking much better, it is the feeling so much better. I finally feel comfortable in my body. I could go on forever telling you all the benefits of losing weight, all the wonderful moments that occurred along the weightloss journey, but this is already getting quite long winded. If you have any questions, comments or just want to talk, please feel free to e-mail me. Let me know you were here, Sign My Guestbook! To see more pictures, have a look at my before and after pictures page (although there are not many before pictues as I avoided the camera like the plague!) or look at my photo album page. Wow, I can not believe it has been an entire year since I reached my goal weight. I really have not had the time to put as much work into these pages as I had hoped to. Now seems like a good time for an update for those who do check out my page. I have loved all the input and encouragement I have received from the many visitors. First of all, yes, I have kept the weight off. I am still within the weight range I set for myself. I still watch what I eat but I do allow myself to splurge (sometimes for days at a time lol). I just make sure that I stay in my weight range and as long as my clothes are still fitting I am happy. I feel comfortable with my body and that is such a great feeling! Every single day, I am so thankful that I lost the extra weight. Healthwise, this had been a difficult year. I got the Antiphospholipid Syndrome problems under control with medication and was having a nice stretch of symptom free time where I could exercise and do as I wanted. I just recently was diagnosed with Lupus also after many months of getting progressively worse. One more thing to deal with. I am going to be started on much more powerful drugs to get the disease under control and hopefully I will get a long remission period when that happens. What would an update be without a new picture? 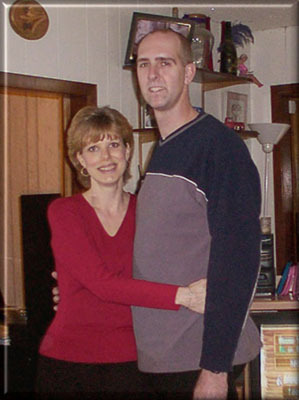 This is my husband and I taken October 19, 2002.